IT was enough to be named Gloucestershire's Cricket Coach of the Year. But for Downend Cricket Club's Thom Manning, collecting the award on the pitch during an England’s Test match was the icing on the cake. Thom won the English Cricket Board award for running the county’s biggest All Stars Cricket programme and for his work with cricket development and HIV/AIDS awareness charity Cricket Without Boundaries. He was presented with the award by Chris Silverwood, England’s bowling coach, on Day 2 of the fourth Test between England and India at The Agas Bowl in Southampton. Thom said: "I was very surprised and delighted when notified of the award. It was personally very humbling to be nominated for both the All Stars Cricket I organise and deliver at Downend Cricket Club and for my volunteering and management of charitable coaching projects with Cricket Without Boundaries in Rwanda. 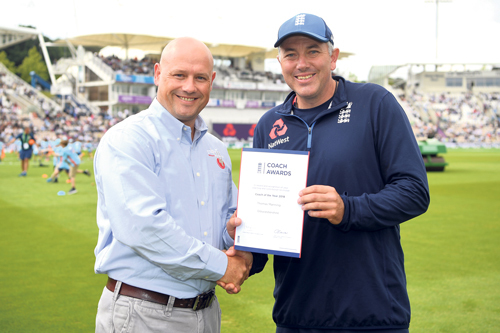 "As one of ten award recipients from across the South West in attendance at the Southampton Test Match, I was very well looked after by the ECB and to be individually awarded our certificates by the England bowling coach Chris Silverwood on the pitch, and to see our names on the big screens, was very memorable." Thom went on his first Cricket Without Boundaries trip to Cameroon in 2014 and has now been on four projects in total. During those trips teams of volunteers from the UK coach in schools and use cricket as a tool to promote HIV/AIDS awareness, gender equality and social cohesion. Downend Cricket Club had around 100 children sign up to the All Stars sessions in 2017 and a similar number this year making it one of the best attended in the country.